Francis (right) briefing Liow and MCA deputy president Datuk Wee Kah Si-ong about the service centre. PENAMPANG: Transport Minister Datuk Seri Liow Tiong Lai has reiterated the Federal Government commitment to help Sabah in terms of infrastructure development. Speaking to reporters after opening MCA Penampang service centre in Lintas Jaya Township yesterday, Liow cited the Pan Borneo Highway which was announced by Prime Minister Datuk Seri Najib Tun Razak. Liow said that the Prime Minister had shown a commitment that the federal government was developing Sabah and Sarawak and it wants to bring more development to both states. He also said that as the Transport Minister, he fully supported the railway line in Sabah and his ministry was ready to work together with the state Government in terms of its railway master plan. Liow disclosed that the master plan would include extending the existing railway line from Kota Kinabalu to Sandakan and Tawau. “Railway is of course a state matter but the Federal Government has provided allocation to help the State Government,” he said, adding that the Transport Ministry had allocated RM200 million to support the State Government’s railway line development. “We can work together with the Sabah Government in terms of the state’s railway master plan that will include Sandakan and Tawau routes and how we can fully utilize the railway line to carry cargo and strengthen the ports in these places, especially Sepanggar Port,” he said. He also said that Sepanggar Port can be an international port and cargo volume was needed to strengthen the port but the infrastructure must be ready first. The Federal Government, he stressed, was committed to help Sabah in terms of infrastructure development. 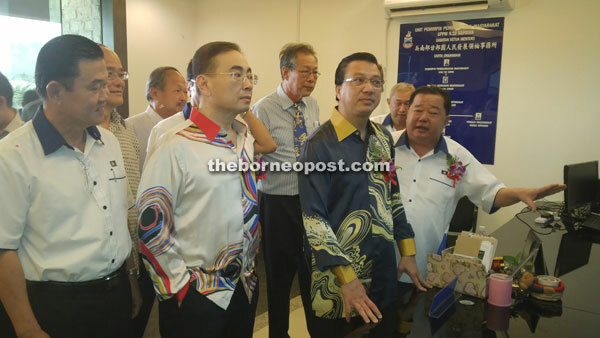 On MCA Penampang new service centre, Liow said that the setting up of the facility showed the commitment of the division to help the people. The party president said the commitment showed that the division not only provided services, it would also like to speak up for the people in Penampang. “They will be the bridge helping to connect the people in Penampang to the State and Federal Governments. MCA is here to serve and provide leadership as well as more development to Penampang,” he said. “MCA is fully prepared to face the next general election. We are not only setting up a service centre, more importantly we would like to connect to the people directly to the voters. Through modern technology, news letters as well as our communication network in Penampang. “I am happy to note that Penampang division chairman Datuk Francis Goh is a very capable leader who has shown leadership to the people here and he is also committed to the development in Penampang. “He is putting in a lot of effort to serve the people here and he is a person with high integrity, with capabilities whom we hope will be able to lead MCA Penampang to win in the next general election,” Liow said.